Little Green Monsters | Tennessee Aircraft Services, Inc.
I’m a mechanic, not a plumber…unless I have to be. Basic home plumbing repair isn’t rocket science and usually consists of simply replacing seals or gluing plastic pipes together. Never the-less, when faced with the most simple of repairs I am rarely able to foresee the details required to complete the job with just one visit to [insert favorite hardware store here]. As a matter of fact, I quantify the severity of the job by how many trips to the store it takes. The point is, I can’t think of all the possible twists and turns the repair might take, and it’s just fixing a leaky pipe! Imagine what it would be like to design, develop, and produce a new airplane. The Lancair/Columbia continues to be a cutting edge design with several detail problems. Some of the sleek innovations and features of the Lancair/Columbia series airplanes require compromises in one form or another. In this case, certain innovations and features call for very small wiring connectors in a few key aircraft systems. These “little green” connectors are not the typical well-proven aircraft connector assemblies. 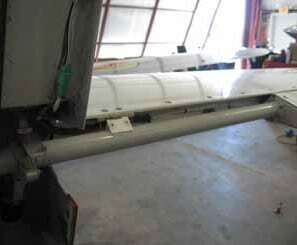 They are the primary cause of intermittent problems associated with the aileron and elevator trim indications. G1000-equipped planes also have these connectors in line with all the switches in the flight control sticks. This includes the trim, radio transmit push- to-talk, auto pilot disconnect, and control wheel steering. Many shops have used creative approaches for making more lasting repairs to these connectors. Issues with the connectors include moisture getting to the contacts and vibration causing intermittently high resistance in some of the pins. We had very good success by cleaning the contacts with Stabilant 22. We then coated the outside of the assembly with Dow 4 silicone grease. A length of heat shrinkable tubing is slid over everything and shrunk in place. This seals the assembly and the Dow 4 repels any moisture that may get through. The heat shrink also adds some stability from the vibrations of the airplane. So far, this fix has performed well but Cessna has developed a more permanent solution. Cessna Service Newsletter SNL10-3 dated April 13, 2010 has all the details one needs to replace those green connectors with either AMP LMD or CPC connectors. The newsletter has a very good step by step explanation of the complete connector replacement process so I won’t duplicate any of that here. There are just a couple of small details that could be highlighted. The original connectors are not designed to be disassembled. There’s no provision to push the contacts out of the connector shells. To install the new contacts one just cuts the wires off at the old connector to install the new contacts. The wires are not labeled in any way so some pre-planning at this point is important. Cutting the wires one at a time and installing in the new connector is one option. Another is to attach temporary labels to the wires before cutting. We chose to do both, just in case. We also made a rather obvious discovery: if you cut a connector out of a line of wire it will shorten the length by about an inch. Naturally, if one didn’t think through the entire job before beginning, one might cut the old green connector out of the harness before ensuring there was enough extra slack to accommodate the reduction. If your plane doesn’t have enough wire length then some slicing may be in order. In the case of the connector located on the back of the vertical fin, a new harness can be made from that connector to the trim servo connector in the right horizontal. This second connector is one of the green units – which would likely be getting replaced at the same time anyway. If you are having persistent problems with any system related to these connectors you can continue to clean and treat the various contacts with Stabilant 22. Or you can make the one time fix and install the new connectors. If your trim indicators aren’t flaking out or your pushto-talk isn’t intermittent, don’t fix it. If they are, then make the permanent fix first and save the frustration.